Scotty’s Brewhouse, the Indianapolis based craft beer sports bar, recently signed a sponsorship agreement with the Indianapolis Colts that includes several exclusive promotions through the 2018–19 football season. Further, Thr3e Wisemen Rocky Ripple will be featured at different points throughout the stadium. Thr3e Wisemen Brewing Company are the beer connoisseurs behind Scotty’s Brewhouse. Scotty’s Brewhouse kicked off their partnership by hosting the Colts 2018 NFL draft party at their downtown Indianapolis locations. Fans, cheerleaders and Colts players were on hand as the Colts announced their first round draft pick on Thursday, April 26. 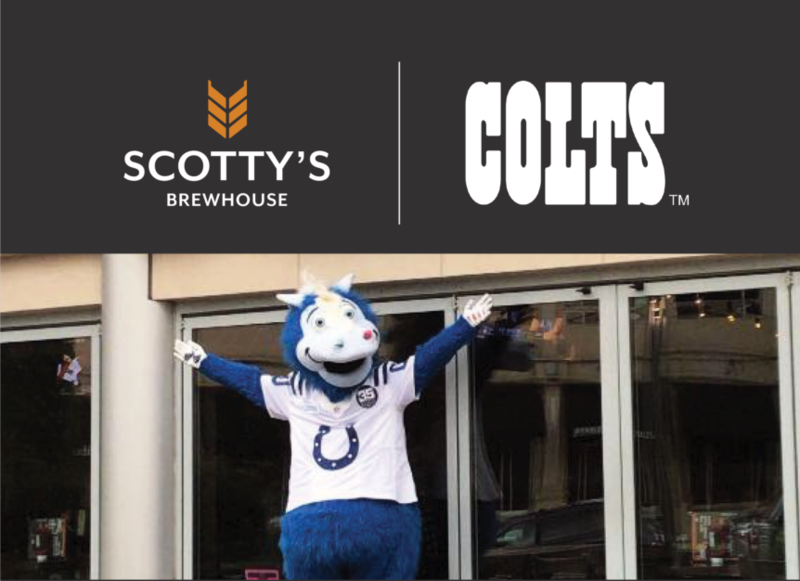 On July 10, Scotty’s Brewhouse Downtown Indianapolis location will be the home to a Mascot dinner featuring Blue, the Colts’ mascot, along with some of his mascot friends from around the NFL. This event will begin at 6 p.m. and last until 8. Guests that evening will be able to interact with the mascots, take pictures and get autographs. Other mascots attending the dinner will be in town to participate in the Mascots vs. Peewees Football Game at Carmel High School on Thursday, July 12. As the season kicks off Scotty’s Brewhouse guests will receive a two for one offer if the Colts score two touchdowns during that week’s game. The promotion will run from Sunday after the game through Tuesday of that week. Guests will be able to order any food menu item and get one free of equal or lesser value when they mention the Colts’ two touchdown offer. Fans attending Colts’ home games at Lucas Oil Stadium will also receive an exclusive offer on the back of their ticket stubs that will be good through the entire football season, including the preseason. In addition to the game day promotions Scotty’s Brewhouse will be doing various contests throughout the year featuring Colts tickets, memorabilia and other prizes.